Previously available only on the website, members can now find accumulators in the palm of their hand by going to “More,” then “Spending” on the mobile app. This section also has definitions of common terms related to member costs. Note: Claims that have been completed and are in progress may add to or subtract from the current totals. Some services might not apply to the deductible or out-of-pocket maximum. The new version of the app is available on the Apple App Store and Google Play Store. 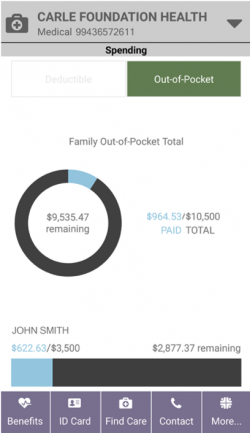 Please let your employees know about the app and how it makes it easier to use their plan. To learn more, go to HealthAlliance.org/App. If you have questions, contact your client consultant. It’s time for your employees interested in the College Extended Network Program to sign up or renew their dependents’ participation for the 2018–19 school year. The College Extended Network Program is available for dependent children who leave our service area for 90 consecutive days or more to attend a college, university, technical school, or vocational school. They’ll have access to in-network care through the national PHCS Healthy Directions and Multiplan networks while at school for no additional cost. Review our previous flash for more details. Please note that retrospective participation in the program is not allowed. Participation will start August 1 for those who submit forms before the academic school year begins. Otherwise, participation will be effective the first day of the following month after we receive the student verification form. The College Extended Network Program is automatically included for fully insured small and large groups for no additional fee. Self-funded groups can choose to add the program for no administrative fee. An additional cost for use of the MultiPlan network will apply. Self-funded groups who are interested in opting in to the program should contact their client consultants. To sign up or renew a dependent’s participation in the program, an employee must send a student verification form to us. The form is posted on Your Health Alliance for employers. If you receive verification forms from your employees, please send them to us as soon as you can or ask the employees to do so. Again, we do not allow retrospective coverage. We’re sending letters to previously enrolled employees to let them know it’s time to renew their dependents’ participation in the program. If a dependent will no longer be attending school outside of our service area, employees don’t need to do anything. Their participation in the program will automatically end, and we will send a new ID card for the dependent to use in the standard Health Alliance network. If you have questions, contact your client consultant. Employees should call the customer service number on the back of their ID cards with questions. Our app team continues to add features and make improvements. One function currently available on the website that will be added to the mobile app soon are accumulators. 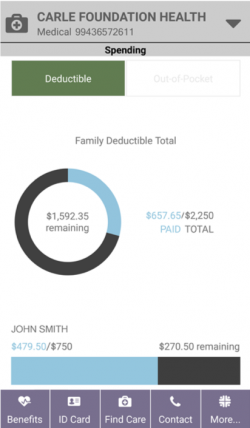 These will allow members to see how much they have left to spend before meeting their deductibles or out-of-pocket maximums—and make informed decisions about when to have a treatment or procedure. Watch for an update on accumulators this summer. Please let your employees know about the app and how it makes it easier for them to use their plan. To learn more, go to HealthAlliance.org/App. If you have questions, contact your client consultant. Our goal is to make sure our members’ needs are being met, even outside of regular business hours. To help us achieve that, some of our care coordinators work Saturdays from 9 a.m. to 2 p.m. CT, and they may call members during that time. We know some people might find it unusual to receive a call from us over the weekend, so we wanted to let you know about these extended hours. If you have any questions, please contact your client consultant. Benefit Planning Consultants, Inc. (BPC) was recently purchased by Ascensus, a technology-enabled solutions provider. BPC provides many services related to our plans, like COBRA continuation coverage notices and administration of health savings accounts, health reimbursement accounts and flexible spending accounts. We do not expect this acquisition to change how we work with BPC in any way. Ascensus will allow them to work independently, keep all employees and remain based in Champaign. BPC believes this change will give them more opportunity for collaboration.